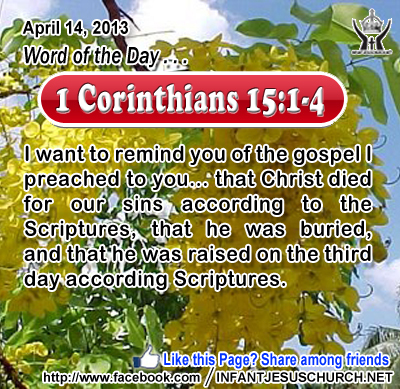 1 Corinthians 15:1-4: I want to remind you of the gospel I preached to you... that Christ died for our sins according to the Scriptures, that he was buried, and that he was raised on the third day according Scriptures. Heavenly Father, thank you for the empty tomb and Jesus' victory over the grave. Just as Jesus' death pardoned our sin, his resurrection assures our future. Thank you for grace and glory. May our life be lived each day by the power of the resurrection. In Infant Jesus name we pray. Amen. 1After this Jesus revealed himself again to the disciples by the Sea of Tibe'ri-as; and he revealed himself in this way. 2 Simon Peter, Thomas called the Twin, Nathan'a-el of Cana in Galilee, the sons of Zeb'edee, and two others of his disciples were together. 3 Simon Peter said to them, "I am going fishing." They said to him, "We will go with you." They went out and got into the boat; but that night they caught nothing. 4 Just as day was breaking, Jesus stood on the beach; yet the disciples did not know that it was Jesus. 5 Jesus said to them, "Children, have you any fish?" They answered him, "No." 6 He said to them, "Cast the net on the right side of the boat, and you will find some." So they cast it, and now they were not able to haul it in, for the quantity of fish. 7 That disciple whom Jesus loved said to Peter, "It is the Lord!" When Simon Peter heard that it was the Lord, he put on his clothes, for he was stripped for work, and sprang into the sea. 8 But the other disciples came in the boat, dragging the net full of fish, for they were not far from the land, but about a hundred yards off. 9 When they got out on land, they saw a charcoal fire there, with fish lying on it, and bread. 10 Jesus said to them, "Bring some of the fish that you have just caught." 11 So Simon Peter went aboard and hauled the net ashore, full of large fish, a hundred and fifty-three of them; and although there were so many, the net was not torn. 12 Jesus said to them, "Come and have breakfast." Now none of the disciples dared ask him, "Who are you?" They knew it was the Lord. 13 Jesus came and took the bread and gave it to them, and so with the fish. 14 This was now the third time that Jesus was revealed to the disciples after he was raised from the dead.15 When they had finished breakfast, Jesus said to Simon Peter, "Simon, son of John, do you love me more than these?" He said to him, "Yes, Lord; you know that I love you." He said to him, "Feed my lambs." 16 A second time he said to him, "Simon, son of John, do you love me?" He said to him, "Yes, Lord; you know that I love you." He said to him, "Tend my sheep." 17 He said to him the third time, "Simon, son of John, do you love me?" Peter was grieved because he said to him the third time, "Do you love me?" And he said to him, "Lord, you know everything; you know that I love you." Jesus said to him, "Feed my sheep. 18 Truly, truly, I say to you, when you were young, you girded yourself and walked where you would; but when you are old, you will stretch out your hands, and another will gird you and carry you where you do not wish to go." 19And after this he said to him, "Follow me." The gospel gives us a vivid picture of the reality of the resurrection. Jesus went out of his way to offer his disciples a variety of proofs of his resurrection - that he is real and true flesh, not just a spirit or ghost. In his third appearance to the apostles, after Jesus performed the amazing catch of fish, he prepared a breakfast and ate with them. Peter’s prompt gratitude of the Master and exclamation, "It is the Lord!" stands in sharp difference to his previous denial of his Master during the night of arrest. The Lord Jesus is prepared to reveal himself to each one of us as we listen for his voice and open our hearts to receive his word. Do we recognize the Lord's presence in our life and do we receive his word with faith? Loving Infant Jesus, inflame our heart with your love and remove everything that is unloving, cruel, ungrateful, unholy and not in accord with your will.